Adapted from December article for BL Magazine. The thought of pottering about in the chilly, damp [sometimes frozen] old garden is probably the last thing on our minds at the moment. Most normal people will quiver at the prospect and opt for the cosy, Christmasy warmth of our homes. If you are bold and mad enough [and glamorously wadded in thermal layers + earmuffs] to venture out on one of the least harshest days, there is still stuff to be getting on with at this time of year… from de-cluttering the side of the house [mine especially] to attempting to sharpen tools and if you’re really keen, re-organising borders. Lately, as growth in the gardens has slowed, I’ve found myself being pre-occupied with composts. 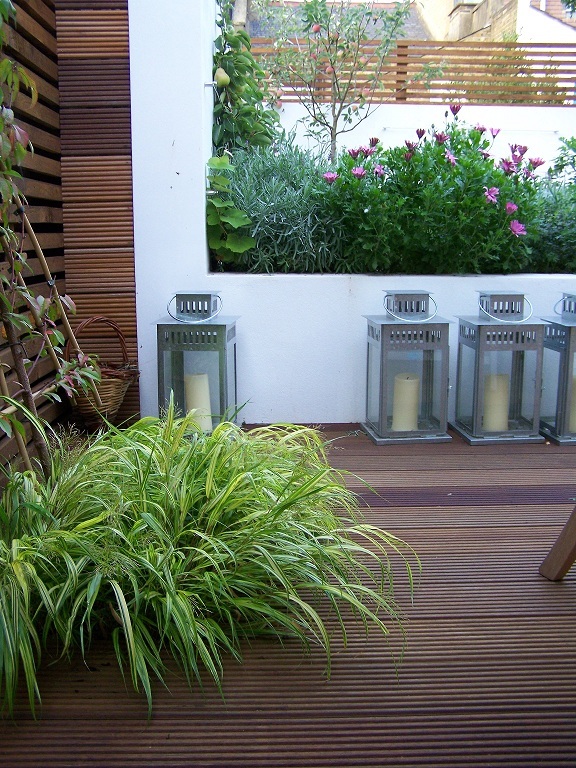 Looking at cheap ways to create a stonking 3-binned system; renovation ideas for a rather hap-hazard one that lives in one of my customer’s gardens; and a mental note to make more effort at turning them all [including mine]! Consequently, I’ve been doing a bit of research, refreshing memories and literally delving into crumbly composts, nearly [but not quite] spearing frogs and scaring away families of mice. Lovely. Despite all the creepy crawlies, composts are the supreme powerhouses for our gardens and no true gardener should be without one. If by some incredible reason you don’t possess one, getting one should be at the top of your to-do list [or Christmas wish-list!]. Composts are remarkable eco-systems of decomposition. Billions of micro-organism [bacteria, fungi, yeast] along with the humble earthworm will transform all your garden clippings and vegetative kitchen waste into beautiful luxurious, dark, nutritious-rich soil. The whole process is free [apart from the initial buy of the bins if you don’t go down the do-it-yourself route] and it is the best form of soil enricher. Garden compost is the equivalent of our five-a-day balanced diet. It provides plants with all the essential nutrients [nitrogen, phosphorus and potassium] in a form that is easy for them to take up. What’s more the expert decomposers, the miniscule microbes, come with the compost and continue the breaking down of organic [and inorganic] materials…providing the best slow release fertiliser you can possibly have! And there’s one other thing…because of the light and airy texture of garden compost it helps to improve the structure of your soil at the same time – aiding the drainage of clay soils and bulking up sandy soils to help them retain more moisture. Perfect. Ok RHS notes to the side. Onto the bins, which can be very cheap and easy to make…with a little bit of imagination and, in some cases, muscle. Wooden pallets are one option, which can be sourced [with a lovely cheeky smile – sorry girls I admit to using it every now and then] from your local builder’s merchant or scavenged from skips [if you like doing that sort of thing]. Three pallets would set you up with one decent-sized, open-fronted ‘bin’ and five will give you two, which is essential when you come to ‘turn’ the heap. With seven pallets you’ll have an impressive three-bin composting system that would make your neighbour’s [and me] jealous. Tip: to secure the sides together, super quick and fuss-free, use some extra extra large zip-ties or rope [go for natural brown coloured rope not the bright blue towing rope I did]. For another cheap and easy-to-make compost bin get yourself four posts and a stylish roll of chicken wire, aim for a square around 3ftx3ft. Or, if you want something that actually does exude real style and sophistication and you don’t mind paying a few quid, there are lots of gorgeous, purpose-built, FSC wooden compost bins available. Check out http://www.recycleworks.co.uk/ for some beautiful top-of-the-range examples like the one pictured below [and if you’re feeling flush order one for me too]. 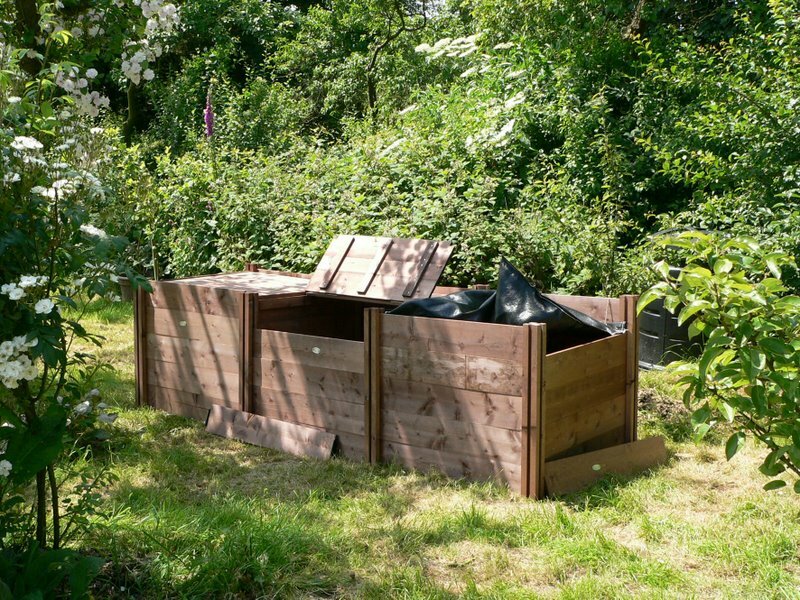 You can also buy plastic compost bins [I have one of these], usually at a discounted rate, from your local council so it might be worth checking them out too. So, you have your compost bin insitu and are eager to start filling with lots of yummy organic material to jump-start that nifty decomposing eco-system? [Picks up RHS notes again], without getting too scientific about it all there are a few things that will help determine what should be put in. It is best remembered as ‘green stuff’ [green leaves, plant/grass clippings, raw vegetables/fruit] and ‘brown stuff’ [chipped wood, dry grass/plant stems, sawdust, shredded newspaper, egg boxes]. The ‘green stuff’ provides the protein and nitrogen for the little micro-organism guys, while the ‘brown stuff’ gives them the carbon and energy they need to do their magic. As in life, you are aiming for a balance. Work in a layer of greens, then a layer of browns and keep alternating…if the heap heats up and you can see the steam rising, whoop whoo. If not, add more green stuff! Should your heap start smelling [like cat wee they say], do the opposite and add more of the brown stuff. Like us, microbes also like a bit of water and some fresh air. Water sparingly to keep moist and be careful not to over water – they don’t like it too wet. For the aeration part, turning the heap every few days will really speed up the rotting process…keeping you fit and fresh aired too. Turning everyday is unlikely and completely unrealistic, I know. You could do it every few weeks instead. Or if you’re really lazy/busy and don’t turn it at all you’ll still get some crumbly compost … you’ll just have to wait about a year and a half for it! If, however, you can’t wait to get your hands on some of this golden compost… doing the deed every few days will speed up the process so much so that, hey presto, 3-4 weeks and it’s there! Now that’s fast food for plants. Article adapted from November issue of BL Magazine. I have a not-so-secret mission to temp and persuade as many people as possible to grow fruit. Any birthday presents I give tend to be of the fruiting kind, pots stuffed with strawberries, a pair of blueberry bushes, a fan-trained cherry, each adorned with a great big bow. I haven’t had any complaints yet. And the best thing is is that these gifts will continue to fruit their socks off for years to come, perhaps a lifetime. Perfect. Part of this mission involves conquering those that are non-gardeners by giving them a little insight into choosing, buying and planting a fruit tree, without frightening them away. Now happens to be the perfect time to do this, buying and planting trees that is… unless you are frozen solid in a winter wonderland! The dormancy that winter brings allows fruit tree growers a great window of opportunity. Over the next few months sleeping specimens can be carefully dug up, with roots loosened of any soil [hence ‘bare root’] and transported far and wide, without causing too much trauma to the plant. Buying bare root at this time of year gives you the most choice in terms of varieties and will be cheaper as there is less packaging and so lower transport costs. Choosing the variety of fruit will be the most challenging decision and I would recommend requesting a plant list from a specialist nursery or doing some research on the internet [see contacts at bottom]. Once you have set your heart on a particular type and variety, just check which pollination group it falls into or whether it is self-fertile. The pollination group is categorised by numbers [1 to 7] and refers to the time the variety blossoms. 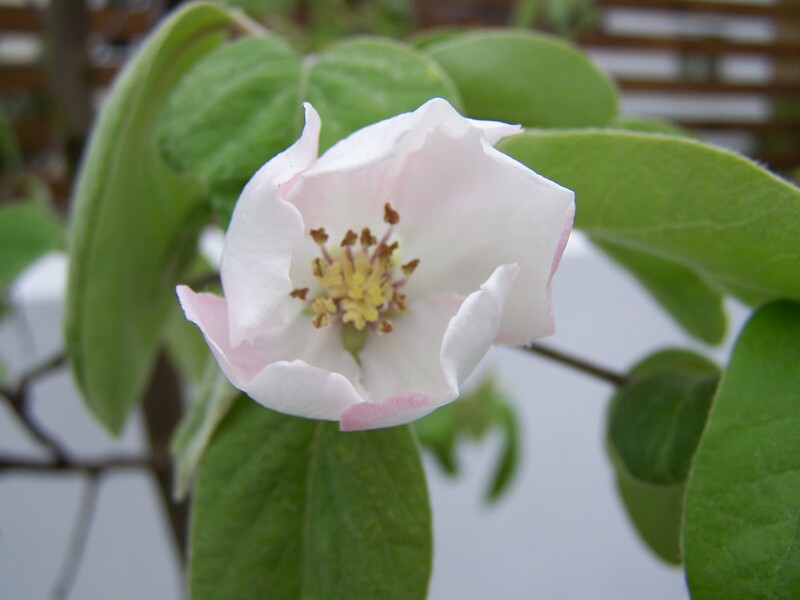 The idea is to choose another variety in the same blossom time to ensure pollination or, if self-fertile, a better crop. One last decision to make is what form of tree to buy and how big you want it to grow. For a smaller garden you may want to buy a ‘trained’ form like a fan or a tiered espalier, or if you prefer the standard tree form choose a less vigorous rootstock. Rootstocks!? 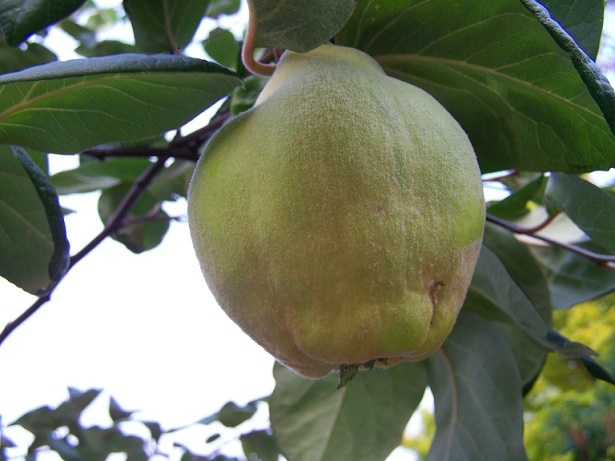 Without getting too technical here…fruit trees [mainly apples and pears] are propagated by joining two separate trees, one being the variety you want to eat and the other being the rootstock which determines how big the tree will grow. 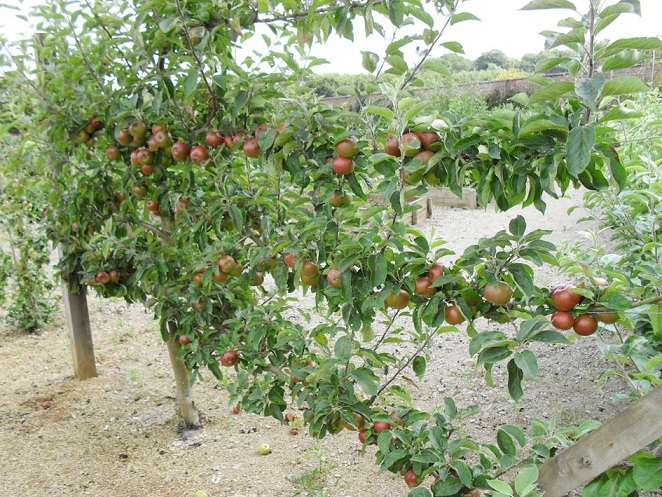 The clever part is…you can have your favourite variety of fruit on any of the available rootstocks. There are a number of rootstock definitions that specialist growers will be very familiar with and they will be more than happy to advise you. However, to give you some examples [and make you sound knowledgeable] for apples ‘M106’ is a semi-dwarfing stock that is suitable for small gardens [up to 3m], ‘Quince A’ is the best dwarfing stock for pears and quinces [up to 3-6m] while ‘St Julian A’ is the best dwarfing for plums [up to 4m]. The next step is to order your bare root specimen[s] and wait, patiently, for them to arrive. As soon as it is delivered, unwrap and plant out. If you’re unable to do this straight away make sure you keep the root system moist and protect from frost. When you do find the opportunity to plant, there are a couple of things to remember. Dig a hole slightly larger than the root system. Fork over the bottom to open up the soil [roots don’t like compacted soil]. Make sure the trunk isn’t sitting too low, aim for the same level it was planted at the nursery [ look for the ‘join’ of the rootstock and variety and make sure this is clear of soil level]. Back-fill, firming soil so there are no air pockets left between the roots. Stake, I opt for the angled approach [facing into wind so it pushes the stake into the ground]. That’s it. A fifteen minute job and a lifetime of pleasure to look forward to. You’ll be tentatively watching for the first blossom to erupt in spring, the first bee to pollinate, the fruitlets to develop, the swelling and changing of fruit shape and colour and finally the first taste…for many many moons to come. Sometimes life brings along some real surprises. 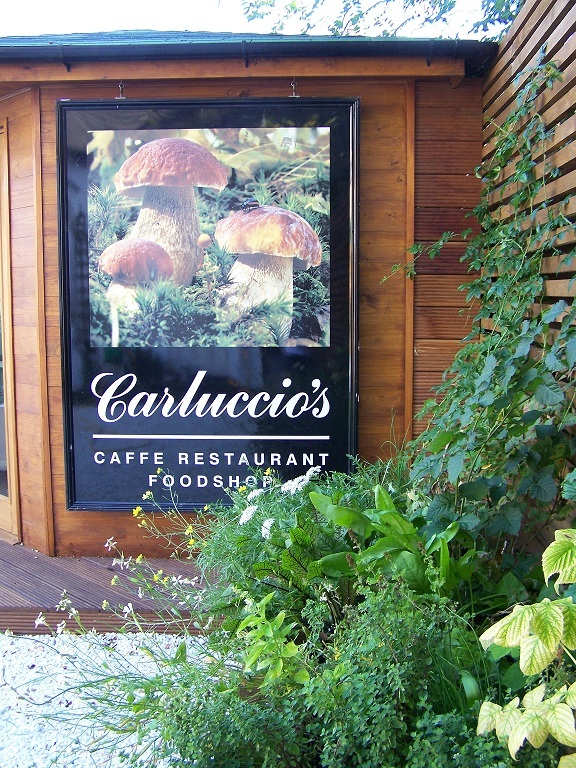 Being approached by the most renowned Italian cook, Antonio Carluccio, to design and landscape his garden was certainly one of those moments. It all came about through exhibiting a small back-to-back garden, ‘Be Fruitful’, at the 2009 RHS Flower Show at Tatton Park. Bizarrely [the Gods must have been looking out for me] the details of my fruit-themed garden had been passed on to BBC Breakfast, who in turn contacted me to find out if I would be up for their early morning live slot to talk about all things fruity. Obviously, and incredibly nervously, I said ‘yeah ok’. Antonio happened to be watching the morning I was featured and happened to have just bought a new property that had a garden that needed some attention. Antonio’s fruit garden is inspired by the ‘Be fruitful’ show garden as he liked many elements of the design. 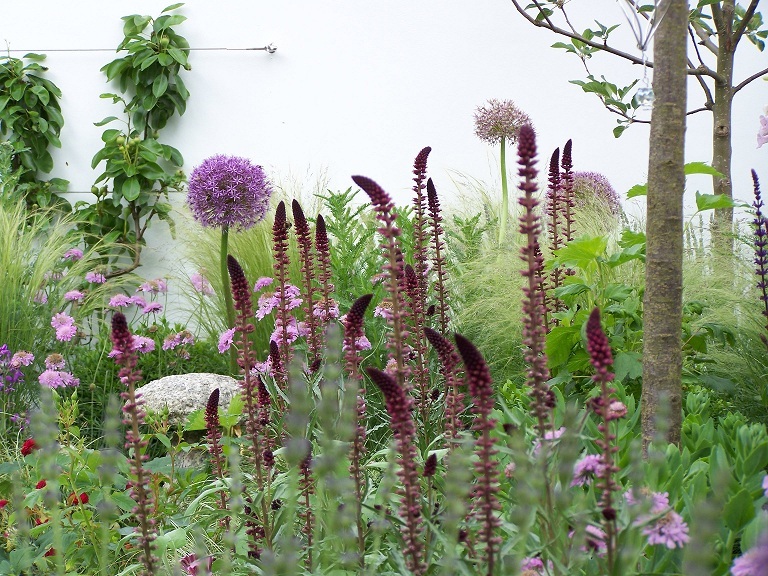 The show garden set out to challenge the way we perceive growing fruit, no longer relegating it next to the compost bins but bringing it to the forefront and mixing it with ornamental perennials, grasses and roses. The design was contemporary, with clean lines, white rendered walls to reflect light and raised beds to allow for easy maintenance. You can see some pictures of it here. Antonio’s garden embodies most of these features as well as fourteen different varieties of fruit. The brief included a number of practical requirements: a workshop; plenty of space for entertaining; an area for a barbeque and spacious raised beds. A variety of fruits, as much grass as possible and a ‘herbery’ were also on the wish list. The layout of the garden maximises the most sunniest aspect for the main raised bed planting area; critical for ripening those fruits. A large circular lawn is central to the garden with a raised curved area of Balau decking leading into Antonio’s dining room. 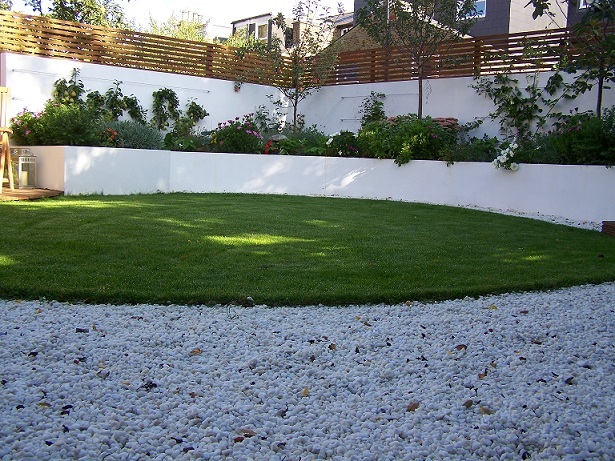 Following the line of the curve from the lawn is the spacious SW facing raised bed, rendered and painted white to give a very clean and modern feel. The ornamental planting is a mixture of perennials, grasses, bulbs, small shrubs and roses to give that all-important interest through the seasons. Many of the flowering plants have been selected to attract butterflies and bees, for example various Alliums, Achillea millefolium ‘Red Velvet’, Salvia nemorosa ‘Ostfriesland’ and Sedum ‘Autumn Joy’. Others have been chosen for their scent Dianthus Firestar, Lavender angustifolia and dwarf stocks; all with a colour palette of rich reds, purples, pinks and white. The garden features three half standard specimen fruit trees, a Cox Apple, Quince Vranja and Oullins Golden Gage, planted in the main raised bed to give height to the garden and to act as a screen to neighbouring houses. More espalier/fan trained fruit trees including another apple; a peach and two double U cordon pears are being trained along stainless steel cables. Soft fruits include strawberries, blueberry bushes, rhubarb, gooseberry, raspberry, tayberry, blackberry and a grapevine… certainly enough for a fruity feast! The raised ‘herbery’ bed includes a number of herbs Antonio is particularly partial to … Italian flat-leaf parsley Petroselinum crispum var. Neapolitanum, garden sage Salvia officinalis, rosemary and wild garlic Allium ursinum along with many more. Selecting fruit for the best flavours and textures was probably one of THE most daunting tasks; especially as the opportunity of tasting varieties was impossible – it was the middle of winter! The strawberries I could guarantee as I inherited an unknown variety that tastes divine, it was just a matter of making sure I had enough good-sized specimens [selected from the previous year’s runners]. For the other fruit, research and cross-referencing research on tastes was the only option. Thankfully I seem to have chosen well as the feedback has been very positive – especially the savouring of the single quince!